Tabata Work Out - 4 Minutes to Remain Fit - Something New Everyday! Tabata workouts might sound tempting if you like the idea of getting fit in four minutes. Find out what’s behind the amazing claims surrounding these exercises and whether they’ll work for you. Tabata is the brainchild of Dr. Izumi Tabata, who trained Japan’s speed skating team back in the 1990’s. Even those trained athletes had a hard time keeping up, but they saw impressive results in just a few short weeks. Celebrities, like Kyra Sedgewick, swear by this program. These workouts are a variation of the interval training that athletes have used for years. You alternate between short bursts of intense activity and gentler recovery periods. With Tabata, you train at full strength for 20 seconds, rest for 10 seconds, and repeat the cycle 8 times. 1. Save time. Many people are drawn to Tabata because you can get fit in less time. Think of everything you can accomplish with the extra hours that you free up. You can spend more time with your family or catch up on home repairs. 2. Increase your anaerobic capacity. Ordinary activities, such as jogging and swimming, will increase your aerobic capacity. Only intense exertion seems to affect anaerobic fitness. Tabata increases your anaerobic capacity because you are strengthening your muscles by forcing them to work very hard for a brief amount of time. 3. Avoid overuse injuries. Daily squash games or long distance running often put too much stress on certain body parts and muscle groups. Shorter workouts may protect your tendons, shins, and muscles. 4. Burn fat. Studies show that Tabata stimulates your metabolism, and you continue burning more calories for about the next 12 hours. That quickly adds up. 5. Lower your risk of diabetes. There’s evidence that Tabata may help balance your blood sugar. Exercise and a healthy diet are both important if you are at risk for diabetes. 1. Know your objectives. Tabata isn’t easy, so ask yourself if it’s an appropriate type of exercise for you. You may want to stick with yoga or other workouts that you enjoy more. 2. Talk with your doctor. Your physician can advise you about your individual circumstances and whether Tabata would be a good idea for you. It’s especially important to get a medical consultation if you have certain medical conditions or have been sedentary for a while. 3. Work with a trainer. A qualified trainer can get you off to a good start. If you’re on a budget, sign up for a group class. 4. Pick up a timer. Precise timing is essential. It can be difficult to estimate how many seconds go by without looking at a clock. 5. Start with familiar movements. Almost any activity can be incorporated into Tabata. Begin with your personal favorites or hop on the treadmill or stationery bicycle. Over time you can add in different kinds of exercises like sprints and jumping rope. 6. Warm up and cool down. Like any exercise routine, it’s a good idea to give your body adequate preparation and a chance to settle down. Begin and end your session with slower and smaller movements. Save stretching for last when your muscles are warm. 7. Keep a journal. A written log will help highlight your progress. Look back over the weeks to see how far you’ve come. 8. Proceed gradually. Consider the option of borrowing some Tabata concepts without going the whole distance. Try taking longer rest periods or doing less than 8 cycles. 9. Be prepared for discomfort. Even seasoned athletes acknowledge that Tabata is challenging. Temporary shortness of breath and other symptoms are natural. You may decide it’s worth the effort or you may want to take a walk instead. 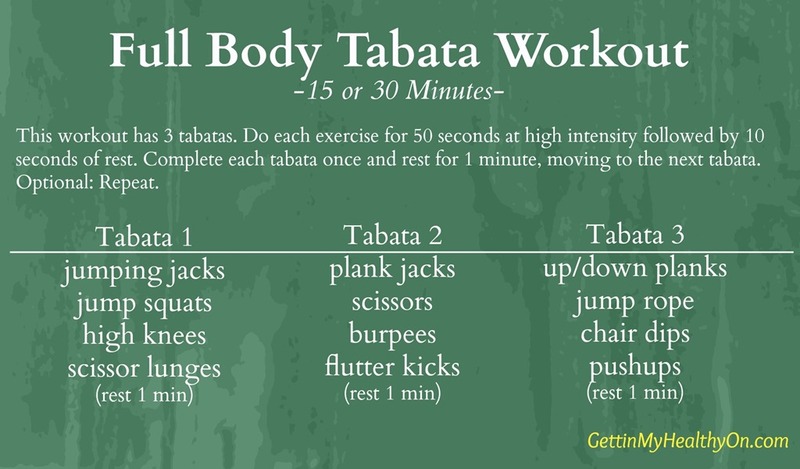 Tabata takes a little longer than the four minutes everyone thinks. However, it still shaves hours off the usual gym time and delivers superior results. You can even adapt the principles to suit your individual conditions and goals so you’ll stay safe while shaping up. The post Read This Before Trying Tabata Workouts appeared first on My Self Improvement Daily.